Early May and Winter is well and truly over here in the Highlands but do check our NEWS page for current details of mountaineering on Skye, late season skiing and regular Alpine reports throughout the summer. Everything that is good about Scottish Winter Climbing - Andy Turner making the first ascent of the 'The Secret', Ben Nevis with the snow capped West Highlands beyond.....Photo Thanks to Sam Loveday. Yes it's exciting times for climbers here in the UK Outdoor Capital - Fort William. Check out our new ski video which indicates how good the skiing in the Alps has been recently. Lots of late winter and spring snow and all very promising for a good 'traditional' snowy alpine summer. Back here in the West Highlands a major thaw with rain at all levels has stripped back much of the remaining snow. There is still loads high up on the Ben but the buttresses are black and the ski fields on Aonach Mor looking a lot leaner. There will still be ice on the fatter lines and easier gullies but some of the thinner lines may have been stripped or be getting rather hollow! It includes crampons, axes, ice-screws, rock boots and various cams - so get bidding! Meanwhile the weather here in the West Highlands has taken a turn for the milder, greyer and damper! Whilst it has by no means gone tropical there have been sea level temperatures of up to 15 C and this combined with some heavy showers will place an additional loading on some of those large remaining cornices overhanging the Nevis North Face. It was a damp start to the day here in Fort William and a lot milder with temperatures up to 15C at sea level. 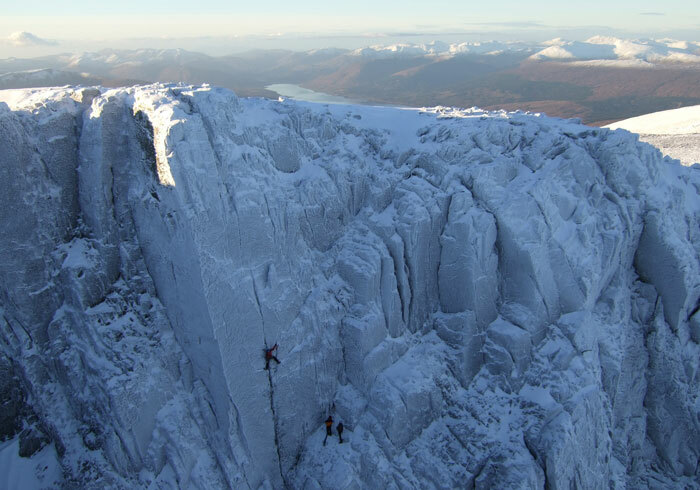 There were still teams up on the Ben enjoying late season ice, folk skiing at Aonach Mor and numerous teams trad and sport climbing as well as bouldering down Glen Nevis - you can do it all on the West at the moment! Hello Rob. My name is Barry Bastin from Exeter in Devon. I was looking at your website reports the other day and noticed that the report of your Grey Corries traverse was on the same day I was up there. I started from Coirechoille and cycled up to the dam. From there I climbed to Bein na Socaich and up to Stob Coire Easain. I then went on to Stob Coire an Laoigh and back to Stob Coire Easain. From there I went on to climb to the summit of Sgurr Choinnich Mor along a superb snowy ridge. The cloud was beginning to descend by then so I then returned to Stob Coire Easain and retraced my steps back to the dam. I didnt see anyone the whole time I was out although I was heading back down at about 14.00ish. You may have come across my tracks (they were probably filled in by then I suppose) as I was wearing snowshoes alot on the time. Now's a good time to buy winter climbing gear - and we have some for sale. Various pairs of crampons, ice screws, pegs as well as some rock climbing gear and outdoor clothing. Check it all out on my ebay page and get bidding! Grey Corries Winter Traverse - The Film! Thanks to Jim Osborne of Glasgow for this note about his winter traverse of the Grey Corries Ridge the day before ours (see below). there is a short film of the Grey Corries bit and our snowhole ("Into the White") on You Tube - we couldn't film on day 2 because of persistent whiteout and very heavy going in soft snow that fell overnight. Here is the link. A snowman cast a watchful eye this morning over all that passed into (or out of) Observatory Gully. It felt like entering The Crucible. Between the Minus Face and Gardyloo Buttress, thousands of metres of climbable ice. I vaguely heard Ian shouting from halfway up the main pitch on Smith's Route "Does this pitch ever end?!" It was a fair point. The main pitch on Smith's Original Route does go on a bit. Never desperately steep but always exposed, always traversing. Tiring and intimidating and a lot more 'atmospheric' than the icicle variation, which was also climbable. But as I'd said to Ian before starting, if you get tired, pumped or gripped then think about 'Mr Smith' and his remarkable step cutting ascent in 1959. The forearms wilt just thinking about it as it's tiring enough with sharp picked Quarks! It was a quieter day on the Ben today with just the odd party out on the classics. The light but gusty Easterly wind brought over some jazz music from the Nevis Range ski area giving a slightly surreal soundtrack to our ascent of Smith's! It was another great spring day for winter climbing on Ben Nevis. Ian and I climbed Two Step Corner, an excellent 4 pitch ice route in very fine condition, a real pleasure. After topping out we wandered over to the top of The Comb to admire the amount of ice between the upper Cascade and Le Panthere Rose. The latter route had some wickedly damoclean icicles hanging down but they seemed a long way off touching down. Intriguingly however there was a party pitching towards the base of them?? There was also a team with a metal detector at the bottom of The Cascade - Hopefully they will have had a digging frenzy and created another big hole / gearing up ledge ala Blair Fyffe & James Edwards during their attempts on the first ascent of 'Rhyme of the Ancient Mariner' on Indicator Wall in the winter of 2001/02. It was a cold and breezy morning on the Ben with a lot of spindrift, trailbreaking and a wintery feel. The afternoon belonged to spring though with sunshine, squeaky ice and great views across the Highlands. This evening had a lovely summery feel with a warm glow to the walk out. Ice still abounds on the Ben and whilst the Curtain completely fell down during the day (not a good time of year to be a low SE facing icefall) there are many classic routes in good condition higher up. Jenny and I enjoyed fine conditions on the superb face between Glovers Chimney and the Cascade. As folk have said before 'throw your guide book away, follow your nose' and enjoy the series of ice grooves and walls that come your way. 'The White Line' was Jenny's first ice climb - and what a place to start. This face has all the atmosphere of Nevis and we climbed it in 6 long pitches on 60m ropes. Snow slopes, ice runnels, slightly awkward belays, ice screws, exposure and a real small alpine north face feel. You could say it was a soft mans Orions! There were plenty of other teams out on the Ice - although no one on a pristine looking Tower Ridge, unlikely to be the case tomorrow. Zero, Orion, Point Five, Smiths, Green, Comb - All the classics - and they were all getting climbed. The high pressure looks set to continue and with coolish air temperatures, overnight frosts and a chilly breeze there seems no danger of an imminent thaw. Conditions at Creag Meagaidh were far better for ski touring and easy mountaineering than steep ice climbing today. As the photo shows the Pinnacle and Post Faces were pretty snowy but with very little exposed ice in evidence. Perhaps a little at the base of Last Post but otherwise it looked pretty disappointing for those bristling with hardware and prospecting for ice, of which there were few. However the new (well, new to me anyway) path is superb and makes the walk (or bike) into the coire far more pleasant and rapid. Up on Ben Nevis things were a lot better although it was a windier and cloudier day than forecast. Andy Houseman soloed a few routes in decent winter conditions including Tower Ridge, The Cascade and Number 3 Gully Buttress. Yesterday Sam Loveday and Tony Stone climbed Minus 1 Gully which was not in amazing condition and provided a fairly tough outing! Down in Glen Coe the snow line was creeping up the hill a bit but there was still a good covering up high. Gaz, Jenny and I made an early season foray to the brilliant sport crag - Tunnel Wall. The sun went in and whilst the friction may have been good it was too cold for small muscles to be working properly and the entirely predictable early season spanking was duly delivered! Jenny, Sam, Alex and I combined more Denali training with the opportunity to traverse some of the fine high peaks of Lochaber (The Grey Corries, Aonachs, Carn Mor Dearg and Ben Nevis) in the superb wintery conditions we have here in the Highlands at the moment. The aim was to have a couple of long days trail breaking with large packs and a camp on snow along the way. We would not be disappointed by any of these aspects and would finish the traverse tired, happy and satisfied with very rouge cheeks over a pint and a wild boar burger in the Achintee Barn (Ben Nevis Inn). Courtesy of a lift up the track above Spean Bridge from Alan Kimber we were able to start the traverse at the Ruigh na Gualainn, due North of our first main peak Stob Choire Claurigh (1177m). Another approach to add a leisurely 3rd day to the traverse would be to walk up to the Lairig Leacach Bothy from Spean Bridge and begin the traverse of the Grey Corries from their most easterly peak of Stob Coire na Caennain. Once above the 600m snow line after an hour on the first day we would not descend out of the constant trailbreaking untill late the next day on the descent of the Nevis Red Burn. The undulating spine of the Grey Corries ridge provides easy winter mountaineering par excellence with views east over the remote Ben Alder massiff and west to our onward journey. large pack full of camping gear (and in Sam's case a bottle of vino and a bag of potatoes!) they do make you think. By the evening we were certainly ready to dig out a couple of snowy ledges for our camp at the bealach between the Grey Corries and Aonach Beag at around 735m. The weather continued as in the typical passage of a cold front - cold and bright, dark and stormy and leaving the exposed cheeks blasted by sun, wind and hail all in the one outing. Descending from Aonach Beag (1234m) we admired some of the complete but snowy lines on the N. Face before negotiating the tricky descending traverse into the high Bealach at the base of the superb E. Ridge of Carn Mor Dearg (The Biancagrat). Food and energy supplies were now dwindling and with the graupel storm at its zenith we needed to galvanise and dig deep. All efforts were rewarded on the summit of Carn Mor Dearg both by half a Chorley cake and a break in the clouds revealing the Nevis North Face in its full winter coat. Still no crampons were required in the conditions resulting from the unusual combination of lots of snow and not much wind. Just keep concentrating and all that remains is the final push up the massive bulk of the Ben. Suddenly there are lots of shadowy figures appearing out of the mist, topping out, coiling ropes and eating sandwiches on the summit. Shed loads of snow and plenty of sunshine gave sunburnt but smiling faces on Aonach Mor today. Reportedly the best snow conditions for the ski resort in the last 7 years and lots of folk enjoying the steep and deep on the East face before whizzing round the perfect traverse to do it all again. Sam, Alex and I were out again on their Denali expedition training course organised by Highpoint mountaineering. We found some snow covered "glaciers" to practice moving together, crevasse rescue and, unusually for the E. face of Aonach Mor, moving up fixed ropes! Large late March dumps of snow have left both the mountains of the Alps and Scottish Highlands with a late season ski bonanza. We recently enjoyed some superb powder days and snowy tours in the Grand St Bernard area of the Swiss Alps and around the Chamonix valley in France. Teams completing the Haute Route also reported fine snowy conditions. Closer to home back here in the West Highland there is excellent skiing off the lifts at Nevis Range and even better Steep and deep up on Ben Nevis. Sam, Alex and I were trailbreaking in the masses of soft snow on Ben Nevis today. They are both off to climb the snowy Alaskan giant Denali this summer and as local Mountain Guide Alan Kimber said today - you can train for anything on the Ben! We enjoyed the sun and blazing a fresh trail up through the well banked out 'Ledge Route'. Good conditions with some impressive cornices high up on the route ready to surprise the unwary in poor viz or contrast. Further South in Observatory Gully teams were climbing on The Orion Face, Point Five Gully and Smiths Route.